East Bay Ferries has a couple of main routes. One connects Alameda, Oakland, San Francisco’s Ferry Building, and SF’s Pier 41 (with seasonal extensions to Angel Island and AT&T Park). Small dogs in carriers are allowed on board: “Special assistance and/or animals in hand-carried containers are allowed on the Alameda/Oakland Ferry.” The second route connects Bay Farm Island (just south of Alameda Island) with SF’s Ferry Building during weekday commuter hours. A customer service representative confirmed in a phone call that small dogs in carriers are also allowed on the Bay Farm Island route. Golden Gate Ferry “operates frequent ferry service between San Francisco and Larkspur in central Marin County, and between San Francisco and Sausalito in southern Marin County.” In a previous post, I reported that Golden Gate Ferry allows small pets in secure containers on board. Should the pet become disruptive during the voyage the crew shall direct the pet owner to move the pet to the utility room for the remainder of the voyage. 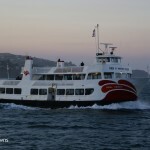 The Red & White Fleet, based at Pier 43½ in San Francisco, operates a variety of pleasure cruises in and around the San Francisco Bay. A customer service representative told me in an e-mail that small dogs (“about the size of a Chihuaha”) in carriers are allowed on board.